King George VI succeeded to the British throne following the abdication of his brother Edward VIII after less than a year on the throne. He was the second son and preferred heir of his father King George V.
The George VI issue shows the king in the uniform of Admiral of the Fleet. First issued were the ½d green, 1d red and 1½d chocolate in July 1938. 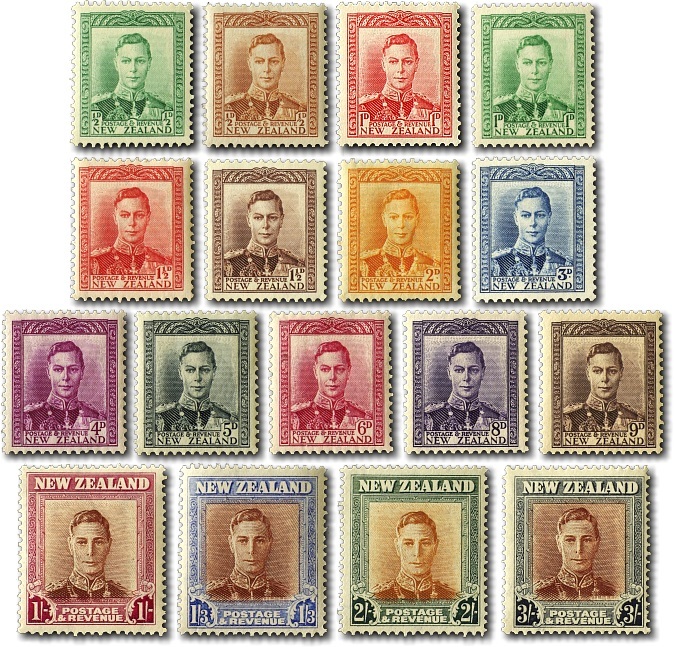 However, plans were disrupted by the Second World War and wartime postal rate increases meant that new values were required while the colours had to meet the Universal Postal Unions requirements. To fill this role, the ½d stamp was surcharged 1d and the 1½d surcharged 2d in 1941. These stamps are listed separately in the catalogue under 1941 King George VI Provisionals. Later in 1941, the 1d stamp was issued in green with the ½d stamp now a chestnut colour, and the 3d value was added to the set. The 1½d red was not issued until 1944 and all the other values appeared after the war in May 1947. In the early 1950s just before the stamps were withdrawn an oversupply of the ½d brown and 1d green stamps were used up by surcharging them to cover new postage rates. These stamps are listed separately under 1952 King George VI Provisionals.